Bloom’s Taxonomy is a classification of the different objectives and skills that educators set for their students (learning objectives). Remembering: Retrieving, recognizing, and recalling relevant knowledge from long‐term memory. Applying: Carrying out or using a procedure for executing, or implementing. Like other taxonomies, Bloom’s is hierarchical, meaning that learning at the higher levels is dependent on having attained prerequisite knowledge and skills at lower levels. 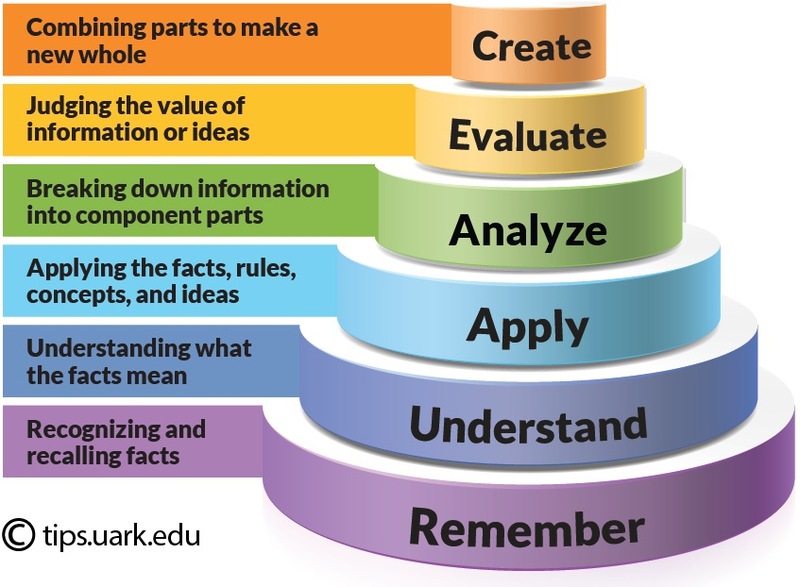 You will see Bloom’s Taxonomy often displayed as a pyramid graphic to help demonstrate this hierarchy. We have updated this pyramid into a “cake-style” hierarchy to emphasize that each level is built on a foundation of the previous levels. You may use this graphic for educational or non-profit use if you include a credit for Jessica Shabatura and citation back to this website. Are lots of your students freshman? Is this an “Introduction to…” course? If so, many your learning objectives may target the lower order Bloom’s skills, because your students are building foundational knowledge. However, even in this situation we would strive to move a few of your objectives into the applying and analyzing level, but getting too far up in the taxonomy could create frustration and unachievable goals. Are most of your students juniors and seniors? Graduate students? Do your students have a solid foundation in much of the terminology and processes you will be working on your course? If so, then you should not have many remembering and understanding level objectives. You may need a few, for any radically new concepts specific to your course. However, these advanced students should be able to master higher-order learning objectives. Too many lower level objectives might cause boredom or apathy. Fortunately, there are “verb tables” to help identify which action verbs align with each level in Bloom’s Taxonomy. You may notice that some of these verbs on the table are associated with multiple Bloom’s Taxonomy levels. These “multilevel-verbs” are actions that could apply to different activities. For example, you could have an objective that states “At the end of this lesson, students will be able to explain the difference between H2O and OH-.” This would be an understanding level objective. However, if you wanted the students to be able to “…explain the shift in the chemical structure of water throughout its various phases.” This would be an analyzing level verb. Adding to this confusion, you can locate Bloom’s verb charts that will list verbs at levels different from what we list below. Just keep in mind that it is the skill, action or activity you will teach using that verb that determines the Bloom’s Taxonomy level. Create design, formulate, build, invent, create, compose, generate, derive, modify, develop. By the end of this lesson, the student will be able to design an original homework problem dealing with the principle of conservation of energy. Evaluate choose, support, relate, determine, defend, judge, grade, compare, contrast, argue, justify, support, convince, select, evaluate. By the end of this lesson, the student will be able to determine whether using conservation of energy or conservation of momentum would be more appropriate for solving a dynamics problem. Analyze classify, break down, categorize, analyze, diagram, illustrate, criticize, simplify, associate. By the end of this lesson, the student will be able to differentiate between potential and kinetic energy. Apply calculate, predict, apply, solve, illustrate, use, demonstrate, determine, model, perform, present. By the end of this lesson, the student will be able to calculate the kinetic energy of a projectile. Remember list, recite, outline, define, name, match, quote, recall, identify, label, recognize. By the end of this lesson, the student will be able to recite Newton’s three laws of motion. For a course to meet the Quality Matters standards it must have learning objectives that are measurable. Using a verb table like the one above will help you avoid verbs that cannot be quantified, like: understand, learn, appreciate, or enjoy. Quality Matters also requires that your course assessments (activities, projects, and exams) align with your learning objectives. For example, if your learning objective has an application level verb, such as “present”, then you cannot demonstrate that your students have mastered that learning objective by simply having a multiple choice quiz. The biggest difference between course and lesson level objectives is that we don’t directly assess course level objectives. Course level objectives are just too broad. Instead, we use several lesson level objectives to demonstrate mastery of one course level objective. To create good course level objectives, we need to ask ourselves: “what do I want the students to have mastery of at the end of the course?” Then, after we finalize our course level objectives, we have to make sure that mastery of all of the lesson level objectives underneath confirm that a student has mastery of the course level objective—in other words, if your students can prove (through assessment) that they can do each and every one of the lesson level objectives in that section, then you as an instructor agree they have mastery of the course level objective. Because the lesson level objectives directly support the course level objectives, they need to build up the Bloom’s taxonomy to help your students reach mastery of the course level objectives. Use Bloom’s Taxonomy to make sure that the verbs you choose for your lesson level objectives build up to the level of the verb that is in the course level objective. The lesson level verbs can be below or equal to the course level verb, but they CANNOT be higher in level. For example, your course level verb might be an Applying level verb, “illustrate.” Your lesson level verbs can be from any Bloom’s level that is equal or below this level (applying, understanding, or remembering). Course level objective 1. (apply) Demonstrate how transportation is a critical link in the supply chain. 1.1. (understand) Discuss the changing global landscape for businesses and other organizations that are driving change in the global environment. 1.2. (apply) Demonstrate the special nature of transportation demand and the influence of transportation on companies and their supply chains operating in a global economy. This trick will help you quickly see what level verbs you have. It will also let you check that the course level objective is at least as high of a Bloom’s level as any of the lesson level objectives underneath. Please read our Learning Objectives: Before and After Examples page. For a longer list of Bloom’s Verbs – TIPS tip: You can also use the “find” function (press: Ctrl-f or command-f on a mac) in your browser to locate specific verbs on this list.